Ultra clear PET Plastic Cold Cups 100 PACK 16 oz. Plastic Clear Cups and Durable high-quality! Rolled rim helps maintain an upscale feel and appearance. Is Great for cold drinks like Iced Coffee, Smoothies, Bubble Buba Tea, Milkshakes & Frozen Cocktails, water, sodas, and juices. Resist cracking! Does not absorb liquid. 16 oz. 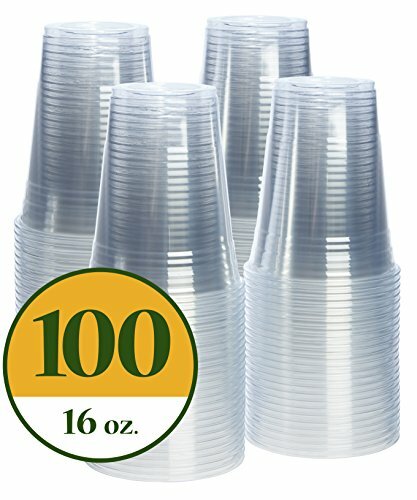 Comfy Package plastic clear cups [100 Pack] is great for cold drinks like ice coffee, smoothies, bubble/buba tea, milkshakes, frozen cocktails, water, sodas and juices. High-quality - Made with only heavy-duty crystal clear durable PET material plastic which is 100% BPA free. Elegant look - Rolled wall rim helps maintain an upscale feel and appearance and makes it great party cups. People friendly - Does not absorb liquid and is crack-resistant with no sharp edges in sight. Upgraded day - Sipping your daily drinks from these elegant plastic cups will add some energy and excitement to your day. If you have any questions about this product by Comfy Package, contact us by completing and submitting the form below. If you are looking for a specif part number, please include it with your message.